Handmade pop-up book with cut paper and letterpress cut-outs. 2012. Handmade book with photocopy transfers, decoder pocket, and wood-burned cover. 2012. Page detail. Handmade book with photocopy transfers, decoder pocket, and wood-burned cover. 2012. Decoder detail. Handmade book with photocopy transfers, decoder pocket, and wood-burned cover. 2012. Handmade accordion book with watercolour paintings and hand-lettered text. 2012. Handmade tunnel book with cut paper and rubber stamp prints. 2012. Handmade pop-up book with cut paper and letterpress. 2012. Page detail. 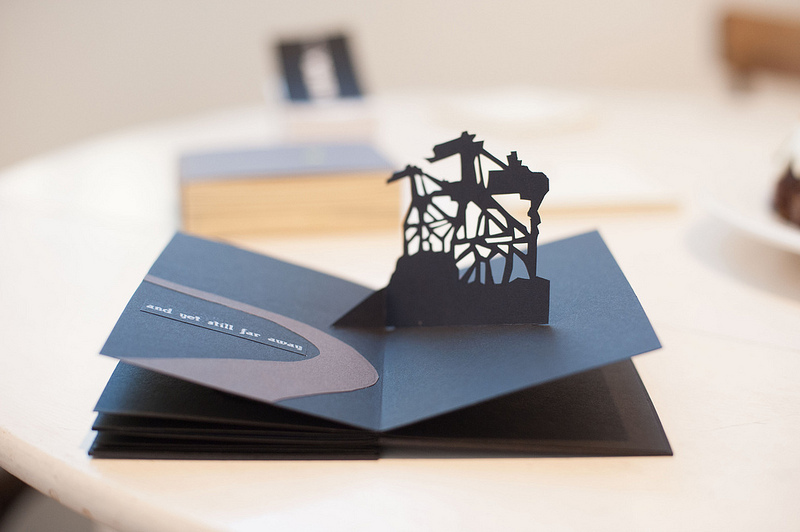 Handmade pop-up book with cut paper and letterpress. 2012.